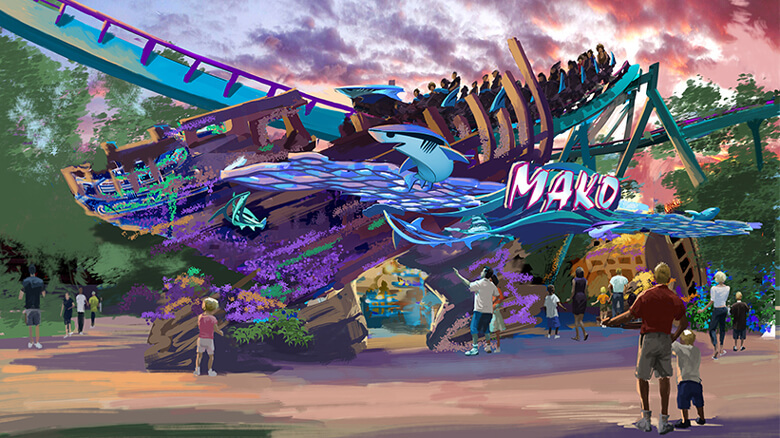 Opening in Summer 2016, Mako is the name of the newest roller coaster coming to SeaWorld Orlando, just announced today. With speeds exceeding 70 mph, Mako will propel riders across a track that’s 4,760 feet long (that’s nearly a mile) and encounter a 200 foot drop. It’s a “hyper coaster,” which is the phrase given to such rides that reach at least 200 feet high and feature a high-speed launch up to 70 mph. The ride will feature multiple, tall hills and high speeds giving guests plenty of “air time”. A 48,000-watt surround-sound system envelops the entire realm also, which will have sound follow the coaster trains as they dive through and around the area. 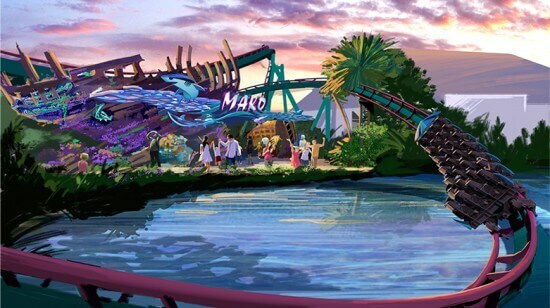 Even the queue for Mako will offer interesting sights and sounds with the queue bringing guests into a undersea theme with lots of shipwrecks and shadows. Minimum ride height for Mako will be 54 inches. Mako will be located next to the park’s Shark Encounter attraction, naturally, as its name is derived from the Mako shark – the fastest fish in the sea. The new roller coaster will also be accompanied by a new area called (for now) Sharks Realm. The new pathway through this area will be reminiscent of a giant shipwreck, with shark theming throughout. 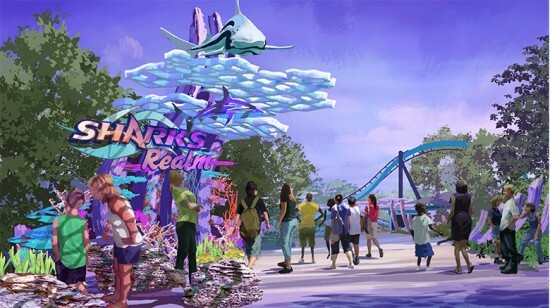 Existing attractions like Shark Encounter and Sharks Underwater Grill will be included in the area. Check back later for video of the announcement and more details. What’s “Mako ” stands for? It look fun that’s going to be. Woooooooooow…….. Look at the pictures dude. 1. 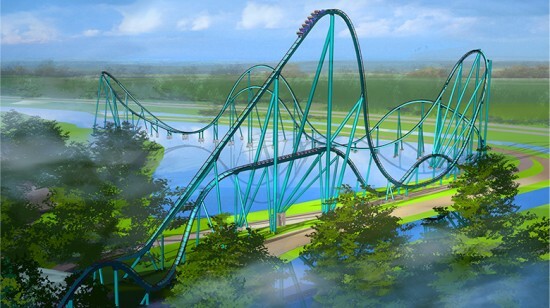 I would love if SeaWorld could bring a Loch Ness rollercoaster from Busch Gardens Willimsburg to SeaWorld Orlando. 2. I would love if SeaWorld would team up with BBC, a British television company, to create theme park attractions based on “Walking with Dinosaurs” television franchise for SeaWorld/Busch Gardens parks. What would you think? Would that be possible at some point? Why or why not? 1. Never going to happen. Loch Ness is an Arrow coaster, and Arrow has been out of business since 2001. You won’t see another Arrow get produced ever. S&S has really raised the bar since they took over. 2. No. Not going to happen. Sea World is all about conservation of living animals. Dinosaurs have been dead for a long time, and doesn’t fit their business model. 3. Do you want to see an entire park get boycotted? Because that’s how you get an entire park boycotted. McDonald’s has no interest or place in the theme park business. 2. I know dinosaurs are dead, but what about Disney’s Animal Kingdom? It has some dinosaur-themed attractions. Heck! Even other animal parks/zoos has some dinosaur attractions as well. 3. Okay how about Cedar Fair (the company who owns Knotts Berry Farm and Cedar Point) would think of own SeaWorld chain and even Six Flags would someday buy Busch Gardens parks? Busch Gardens are ALREADY owned by SeaWorld entertainment. Actually it’s the other way around. I know why they’re boycotting Sea World, why are they boycotting McDonald’s? Or did you mean it the other way around? 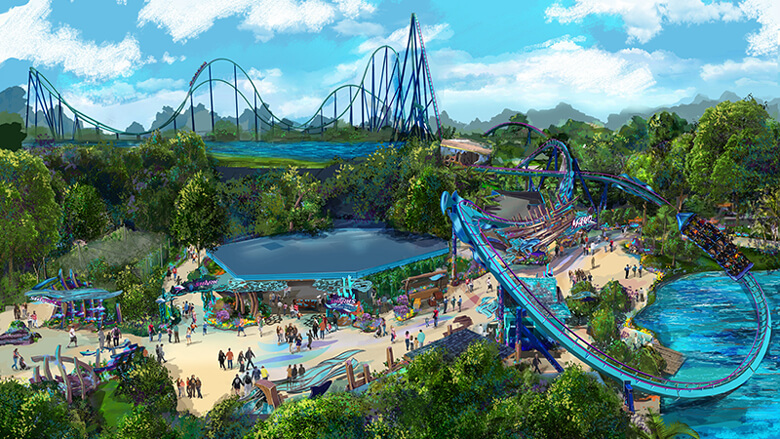 I think that will be awesome for SeaWorld! I wish that Sea World would create a Preshistoric Seas area. Build some animatronics of ancient marine life. There was a Walking with Dinosaurs kind of show about the world’s most dangerous sea creatures of all time, and it went back in time to look at the most fearsome creature in each era. It was really well done. I think looking at ancient marine life is within the scope of Sea World. A big Prehistoric Aquarium would fit in well as an attraction or ride..and it would be fun to play it up that Sea World built a time machine and went back on missions to bring these creatures back for the aquarium. Out and back. Blah. I’ll just ride my home hyper coaster with a better layout, Goliath at Six Flags Over Georgia. Especially in Sea World Orlando’s case, think the point was “A BIGGER, TALLER, LONGER coaster” than the latest one in Universal.